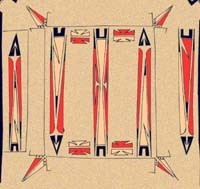 Arrowhead and broken diamond motif. Art has been defined by the anthropologist Alexander Alland as "play with form producing some aesthetically successful transformation-representation." In other words, art is a creative process that produces objects or images that have aesthetic value and also express symbolic or representational meaning. Art has many different media, including paint, stone, wood, ceramics, basketry, textiles, and composite materials. Objects created for utilitarian purposes can be considered works of art if they are embellished in some way with aesthetically pleasing or meaningful contours or designs. As noted by Marvin Harris, "most anthropologists regard the skilled wood carver, basketmaker, potter, weaver, or sandalmaker as an artist." Music consists of vocal or instrumental sounds that express ideas and emotions through the elements of rhythm, melody, harmony, and/or color. Music provides enjoyment and entertainment for audiences and performers alike. It can also have important social and religious functions. For example, music is an effective way to create bonds of cooperation among individuals and to teach various aspects of a society's cultural traditions. The artistic and musical expressions of the Illinois Indians were not created in isolation. Rather, art and music were functional components of the tribes' economic, social, and belief systems. Art objects, for example, portrayed symbolic representations of game animals as well as gods. Similarly, the only traditional piece of music that can be attributed to the Illinois was performed at public ceremonies held to declare peace with other nations.